Making Negitoro Don with Premium Blue Fin Tuna. Fatty and Yum. 1. Mix Rice with Rice Vinegar, place in serving bowl. 2. Use a spoon to scrape off tendon from Toro, chop Toro, and place on top of rice. 3. 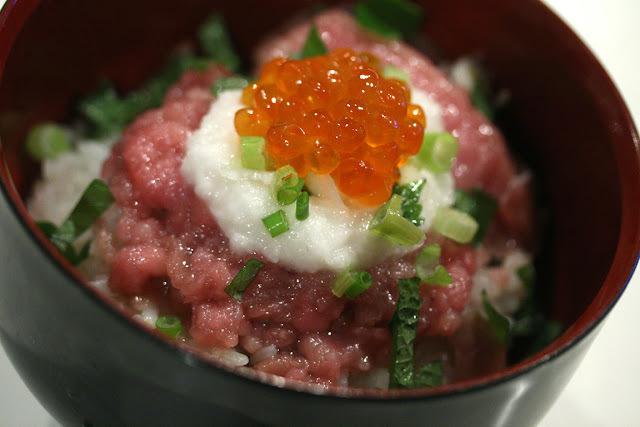 Garnish with grated Japanese Mountain Yam (Tororo), Shiso Leaves, Scallions, Salmon Roe, and Wasabi. 4. Serve with soy sauce on the side.